From the Baldwin County Courthouse, go east on Hancock St. and follow Highway 22 (Sparta Hwy) east for 9.8 miles. Turn left on Carr's Station Road and go 9.5 miles. Graves are located on the right side of the road. 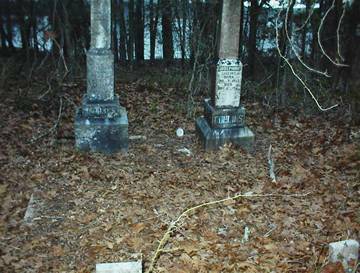 Two 5-foot monuments are visible from the road. Lake Sinclair can be seen on both sides of the grave site. Located on Baldwin County tax map #104X-067. 2 graves marked with old stones. Also there are several other depressions at this site.